Geo Delight combines colourwork, interesting shape, and mesh lace texture to create a cozy, oversized cardigan. You’ll love this design because and it can be both casual and a bit dressy, it’s something you can easily throw on over your outfit for some extra warmth, and it uses several different knitting techniques to keep you on your toes and produce a stunning FO. 36 (41, 45, 48.5, 53, 55, 59.5)” bust/chest circumference. SaveMeant to be worn with approximately 5” of positive ease. This means that you can select the size that’s approximately 5” larger than your actual bust measurement. Knit Picks, Wool of the Andes Superwash, 100% superwash wool; 110 y/50 g: Dove Heather, 26302, 6 (6, 8, 9, 10, 10, 11); Brass Heather, 26319, 1 (1, 1, 1, 1, 1, 1); Indigo Heather, 26309, 1 (1, 1, 1, 1, 1, 1). Mountain Colors 4/8’s Wool, 100% wool; 500 yds/200 gs: Harmony Ice, 2 (2, 2, 2, 2, 2, 3) skeins. One set of Mountain Colors Perspectives Twizzle. Size 6 (4 mm): 24” circular (cir) needles. Adjust needle sizes if necessary to obtain the correct gauge. Markers (m); tapestry needle; size E/4 (3.5 mm) crochet hook; scrap yarn; (optional) yarn bobbins. 18 sts and 24 rows = 4″ (10 cm) in St st in stockinette, blocked. 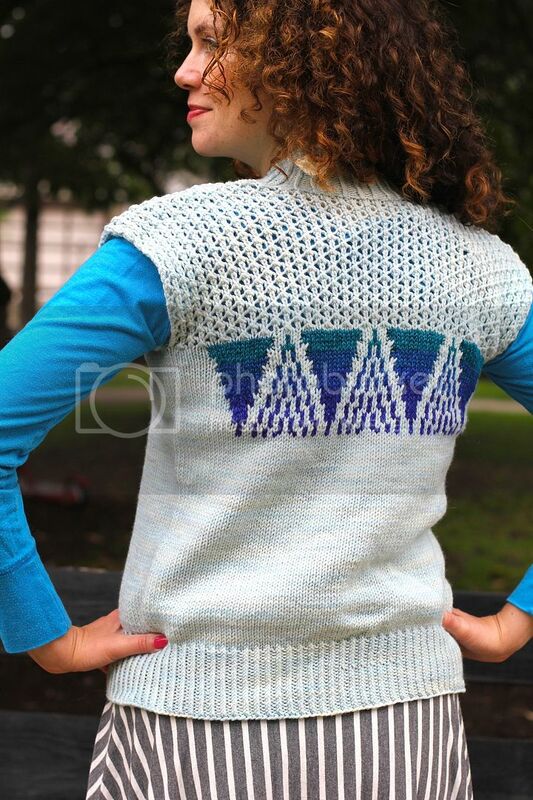 This cardigan uses colourwork. Yarn bobbins are suggested to keep your colours separated and easier to knit with. Blocking where noted in pattern is important; it makes picking up the stitches much simpler. If using gradient colors like Mountain Colors Perspectives, work color 1 for 5 rows of chart, colors 2, 3, and 4 for 4 rows of chart, and color 5 for last 5 rows of chart. If piecing together your own gradient colors from stash, you won’t need more than 20 yards of each color.